Lithuanian side Patvanka became the M45 champions of the ESBA Promo Championship in Liepaja after defeating Project-44 90-73 in the deciding game on Friday at the Liepaja Olympic Center. After a very positive start of the tournament, Project-44 lost the last two games and finished in second place, while Patvanka, representing Kaunas, managed to stay undefeated in five games. The Russian team led in the early going and held an 18-14 lead seven minutes into the game, but it didn’t take long for the green-and-white Patvanka to close the gap. 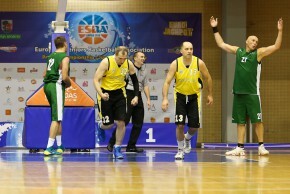 After winning the second period 27-18, the Lithuanians broke away and comfortably closed out the game. Irmunas Juskys had a team-high 26 points, Andrius Grabazys collected 21 points, while Darius Lukminas and Robertas Butkus finished the game with 12 points apiece. Olympic bronze-medalist Lukminas was presented with the MVP award. Sergey Ivanov led Project-44 with 31 points, while Georgy Martyshin was the only other player in double figures with 11 points.